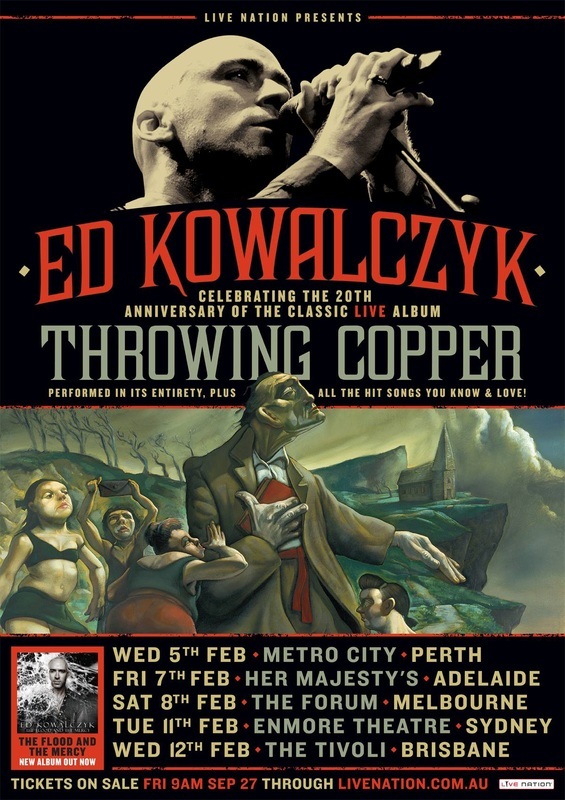 Fans of acclaimed singer-songwriter and enduring solo artist Ed Kowalczyk are invited to be a part of a national tour of special performances celebrating 20 years since the release of Live’s seminal album Throwing Copper. Travel through the career of American rock royalty, Ed Kowalczyk, as he pays tribute to the hits of his past - as the driving force of multi-platinum band Live - through to his solo career including the forthcoming album The Flood and The Mercy (out this Friday) featuring current single Seven. “I wrote the songs for Throwing Copper in a state of mind that was at once empty of any and all expectations, yet full of the potential and possibility that marked the ‘90s music scene in America. Being just 22-years-old at the time, I was literally learning to write songs as I went, feeling and fledgling my way into this probability cloud that had formed around bands like Nirvana, Pearl Jam and Smashing Pumpkins. “The songs on Throwing Copper are an amalgam of my early and enduring interest in the spiritual traditions and a desire to put my own lyrical and melodic mark on the age in which I found myself. I had no idea that songs like I Alone and Lightning Crashes would endure on the radio and in the hearts and minds of my fans for so many years after I wrote them. “Fast forwarding to 2014 and the 20th Anniversary of Throwing Copper's release, I am beyond excited to celebrate the entirety of the record on tour with a new band of amazingly talented musicians and great friends. I look forward to celebrating the release as well as reconnecting with the album as a whole, to putting on my miner's helmet and following that copper line deeper into the mountain and see what we find... wanna come along?